Flies are one of those creatures you wish you didn’t have to deal with sometimes. They can be so annoying, and they never seem to go away no matter what. If you have a really tough fly problem you want to deal with but don’t want to spend money on flypaper, try making the DIY homemade flypaper recipe below. Place all the ingredients in a small bowl. Cut strips of brown paper and the them in the sugar mix. Let the strips dry overnight and then hang them around the house. If you don’t want some type of paper hanging all over your home, this next recipe is for you. It is easier to conceal while on the counter but I guess if it works really well most people are going to notice all the flys caught in it. Fill a jar with all the ingredients. Punch holes in the lid of the jar. If there is no lid, use plastic wrap that seals the lid and punch holes in that. 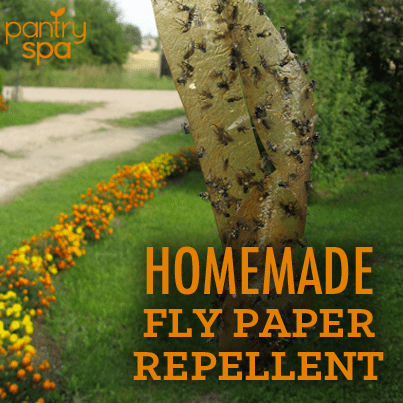 If you don’t have too much time to make your own homemade flypaper or you are opposed to killing a fly, you might want to try making simple fly repellent with some herbs. All you need to do is fill a cheesecloth with crushed mint, bay leaves, or cloves and hang it by the door or outside. It will work as a natural fly repellent. If the two recipes above do not work, give this one a try. It should be able to keep the flies away from you, and it can also be safely used on pets. In a spray bottle, combine all the ingredients, shake well and spray on yourself or your pet.